Can NATO Really Help With The Migrant Crisis In Aegean? Last week NATO has decided in a very unorthodox speedy way -in a very un-NATO fashion- to deploy one of her naval task force to the Aegean sea to deter people-smugglers taking migrants from Turkey to Greece. 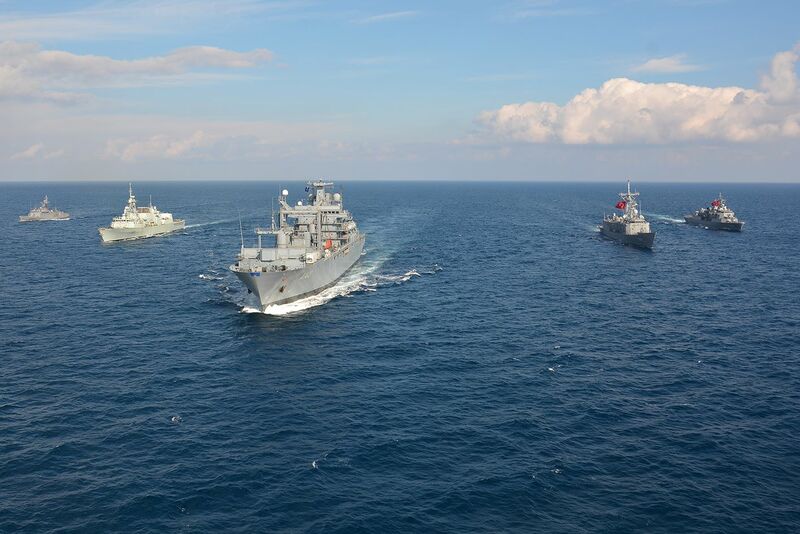 Dispatching Standing NATO Maritime Group 2 (SNMG-2)to the Aegean was not a big deal since the task force spend the previous week near Aksaz Naval Base in Marmaris conducting joint trainings with Turkish Navy. The task force was literally just a few hours away when NATO Defence Ministers agreed that NATO should provide support to assist with the refugee and migrant crisis on 11 February 2016. The SNMG-2 is made up by the A-1413 FGS Bonn, 337 HMCS Frederiction, ITS Libeccio and TCG Barbaros. The flagship of the task force is the German auxiliary FGS Bonn. She is a combat stores ship capable of underway replenishment and can carry 7,850 tons fuel; 1,330 tons water; 280 tons cargo; 220 tons ammunition; 115 tons lubricants. The others are frigates from Canadian, Italian and Turkish Navies, build to hunt and destroy enemy submarines and ships. It is clear that none of these ships are specially designed to the given task of contribute critical information and surveillance to help counter human trafficking and criminal networks. NATO Secretary General Jens Stoltenberg, stressed that this mission is “not about stopping or pushing back refugee boats,” but about contributing “critical information and surveillance to help counter human trafficking and criminal networks.” As part of the agreement, NATO will co-operate closely with national coastguards and the European Union. Military authorities are now working out the details of the mission. The seat of purpose for every naval action is on land. The criminal and human trafficking networks are on land. On the sea are just the migrants trying to survive and cross the sea to the other side. Thus it just does not makes sence for NATO to send one oiler and 3 frigates to fish the helpless migrants from the sea and return them back to Turkey. While the ships of SNMG-2 especially the frigates are capable of gathering information about their enemies through their sensors, I have my doubts if these sensors will be adequate to fulfill the given task in this mission. Searching and locating large metal targets on the surface or submerged is one thing locating small dinghies made from plastic is something else. If NATO nations really wanted to do anything to stop the these criminal networks they should have sent specialised police officers or other law enforcement forces or may be some specialised intelligence gathering ships. The migrant crisis has a very destabilising effect on the European nations and indirectly threatens the security. But instead of draining the swamp NATO is trying to kill the individual mosquitoes. And what makes this effort worse is that NATO uses a hammer is stead of a fly swatter. One Response to Can NATO Really Help With The Migrant Crisis In Aegean? I think you need to research the new sensors and weapons suites aboard the newly updated and upgraded HMCS Fredericton, before you dismiss her capabilities in this new role, at least, before dismissing her effectiveness.